When you visit a gas station, you’re typically thinking about filling your tank and moving on. Stopping at the pump is a necessary part of private transportation, something people have done hundreds of time, and it’s not uncommon to mentally go elsewhere when purchasing gas. There are signs at nearly every gas station advising customers to turn off their car engine – and leave it off – for the duration of their time pumping gas. This is because your vehicle’s engine poses a potential hazard. If a random spark were to occur under the hood, within your car’s electrical system, you could ignite flames around the gas receptacles. Additionally, it is not a good idea to leave your car running while you’re outside of it, as someone could hop into it and drive off. This would not only result in a stolen vehicle, but the gas pump inserted into your car would theoretically spray everyone in the proximity when it was knocked loose from your gas valve, which could also cause significant problems. No matter how hot or cold it is, resist the urge to sit inside your vehicle while the gas is pumping. Drivers returning to their car at the gas pump is one of the leading causes of static electricity, which present a fire hazard. As you slide into your driver’s seat, your clothing makes contact with the seat’s fabric, which can lead to static electricity forming. Then, when you touch the gas pump, a spark could be caused from the accrued static electricity, resulting in a fire or explosion. If for some reason you have to get back inside your car, whether to retrieve your wallet or to assist children or animals, be sure to touch a piece of metal to relieve the static before touching the gas pump. Sitting outside your car waiting for it to refuel seems like the ideal time to have a quick smoke break, doesn’t it? Wrong! Lighting matches or a lighter while near gasoline fumes is a surefire way to cause a spark. Hold off smoking cigarettes, or even electronic smoking devices, until you’re back on the road and far away from any gasoline. 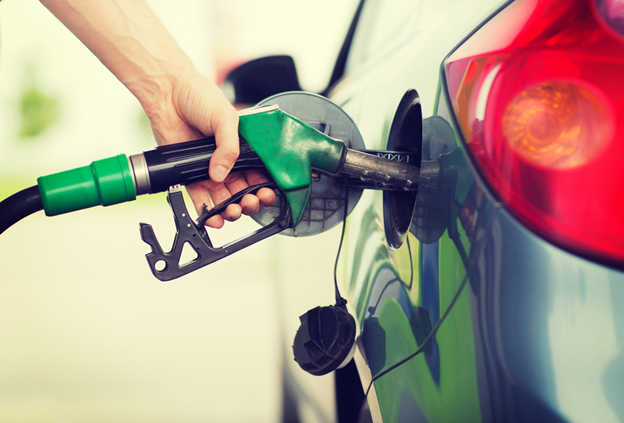 Although there are some safety risks to keep in mind when fueling gas, it’s a necessary part of your day-to-day life. The next time you find yourself in Tripoli, Wisconsin, be sure to fill up your stomach and your gas tank at Tri-Mart BP. For more information about the company, visit their website or call (715) 564-2440 to speak with a representative.